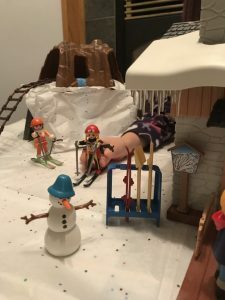 The playmobil Ski Lodge is a perfect start to the Winter Olympics with kids! In 2018 the next Winter Olympics will be held at Pyeongchang, South Korea, from February 9th to February 25th. There will be 102 events in 15 sports and we can’t wait to join in with the excitement! With the 2018 Winter Olympics just around the corner, your family can get in the spirit with playmobil’s new winter themes. What are the Olympics? It’s a time where many people from many countries get together to play games and celebrate friendship, unity and sports every four years. There are Summer Olympic Games and Winter Olympic Games. The games take place in a different country. The first Olympic games originated in Greece, a beautiful country in Europe. 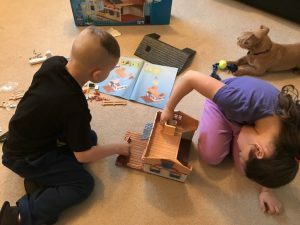 The playmobil Ski Lodge is a great start to learning and playing everything “Olympics”, with room for all of the little guests, skiiers and families. It’s perfect for teaching the kids the difference between Alpine Skiing (downhill or straight racing, and slalom racing around a series of markers), Cross Country Skiing ( where skiers rely on their own locomotion to move across snow-covered terrain, rather than using ski lifts or other forms of assistance) and Freestyle Skiing (performing aerial flips and spins, sliding rails and boxes on their skis). playmobil rates this set for ages 4 and up. My kids are 5 & 7 and were super excited to get into the box and start playing! 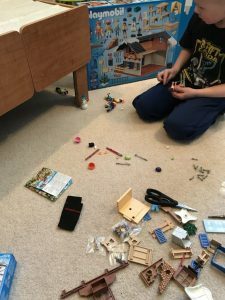 There’s definitely some assembly required as with most playmobil sets, but that’s half the fun. 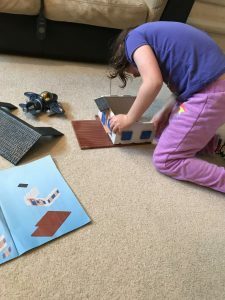 My 7 year old daughter managed to build most of the set but still needed some help with clicking in some of the parts fully, and my 5 year old son, also with a bit of help assembled the people and accessories. The assembly was quite easy and the lodge has a lot of great little details; snow and icicles on the roof, pricing sign & ski hill maps out front, shutters on the windows, logs for the fireplace and more! 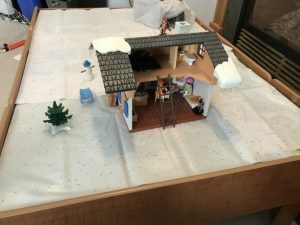 We went to the dollar store and got some white sparkly tissue paper, covered our train table with “snow” and made a little mountain from the train set tunnel, and made a little play area. 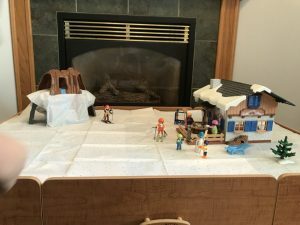 The set comes with the lodge, tables & chairs and stools, food and dishes, 5 people with ski accessories, a snowman and a sleepy kitty cat, beds & bedding and even has a little bathroom! There’s a “hot chocolate” tap on the little food counter, plenty of mugs, some bottled water, and lots of little tiny utensils. and off they went for some skiing down the mountain! Afterward, they headed back to the ski lodge for some hot chocolate by the fire and the kids curled up in their sleeping bags upstairs. We also got the the playmobil Biathlete, a biathlon is a combination of cross-country skiing and rifle shooting, in the summer the biathlon is a combination of cross country running with riflery. This little female biathlete comes with skis and poles, and a rifle with a hook to put it on her back when it’s not in her hand. I love toys that inspire my little girl to dream big dreams! Enjoy watching this year’s Winter Olympics with your little ones, and good luck to all of the participants. The most important thing in the Olympic games is not winning, but taking part.